The British Newspaper Archive now has a total 26,297,490 pages (25,613,154 last month). The 34 papers (64 last month) with new pages online this month include 16 (25) new to the collection. I'd love to be able to report of newspapers digitized by Library and Archives Canada during the month. Leading the additions to FMP this week are 38,386 records of burials at Stoney Royd Cemetery in Halifax. The total for the Yorkshire Burials collection is now 5,164,222. Moving north to Northumberland and Durham come 14,370 new memorial inscriptions from churchyards in Birtley, Blyth, Boldon, Eighton Banks, Gosforth, Great Lumley, Penshaw, Ryhope, South Shields, Whitley Bay, Woodhorn. That collection total is now 119,133 records. Down south, Sussex Monumental Inscriptions adds 1,839 records from churchyards in Eastbourne, Litlington, Lullington and West Dean for a collection total 24,941 records. Bringing life to the additions are 2,485 entries in Kent, Lydd Midwife's Birth Register 1757-1815. The records in this collection were transcribed from the original birth register of William Waylett (1729-1815), a male midwife who practiced in Lydd and the surrounding parishes. The original document is held in the Wellcome Library in London. Transcripts will reveal a combination of birth date, birth place, parents' names and any additional notes. Notes may include details of the pregnancy, delivery, mother, or payment for services. What if LAC's Secret Bench of Knowledge Could Talk? This post was prompted by an item from the Essex Record Office, You Are Hear Listening Bench Tour Draws to a Close. The ERO made location-appropriate audio clips available to those sitting on the bench. What would be an appropriate audio item, or items, for The Secret Bench of Knowledge at the entrance to 395 Wellington? If you have DNA test results at MyHeritage you may find the new result filtering system just introduced useful. There's also a bit of a tweak to the interface. For information take a look at the MyHeritage blog post here. My own MyHeritageDNA results are dominated by matches to Ashkenazi Jewish clients, many I suspect appearing closer than they are owing to endogomy and the attraction for that community to test with an Israel-based company. Even filtering for my Irish, Scottish, and Welsh ethnicity still left the matches dominated by Ashkenazi Jewish clients. I suggest MyHeritage adopt a combined filter that allows filtering in one ethnicity and filtering out another. Read the Library and Archives Canada annual report and you can't help but be impressed by the achievements grouped under fourteen headings. I won't repeat them. What's the highlight? 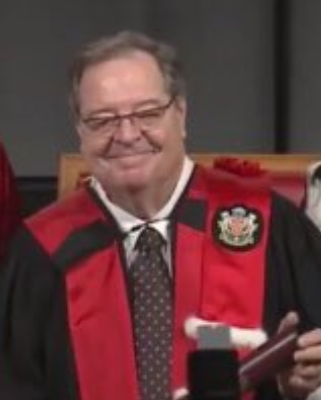 In his introduction Guy Berthiaume writes "First and foremost, as a result of funding allocated to LAC in Budget 2017, the implementation of activities that respond to the report of the Truth and Reconciliation Commission has accelerated significantly, allowing us to contribute to the preservation and revitalization of Indigenous languages." There's a danger in allowing priorities to be dominated by availability of special funding. Yes, historical neglect needs to be addressed. Is that being done by neglecting core activities? Achievements should be benchmarked against those of peer organizations internationally. For instance, was it appropriate to devote the entirety of external funding for the National Heritage Digitization Strategy to LAC indigenous newspaper digitization, especially when the LAC newspaper collection is so neglected? A test will be how the $1 million external funding available to the NHDS in 2018-2019 will be distributed ? A two-part blog post from Library and Archives Canada is about the more than 3,000 nurses who served in the Canadian Army Medical Corps, including 2,504 who went overseas. Part one describes the overall situation for nurses and nursing while part two is about the 21 who died in service from enemy action. Although nurses generally did not serve near the front lines. 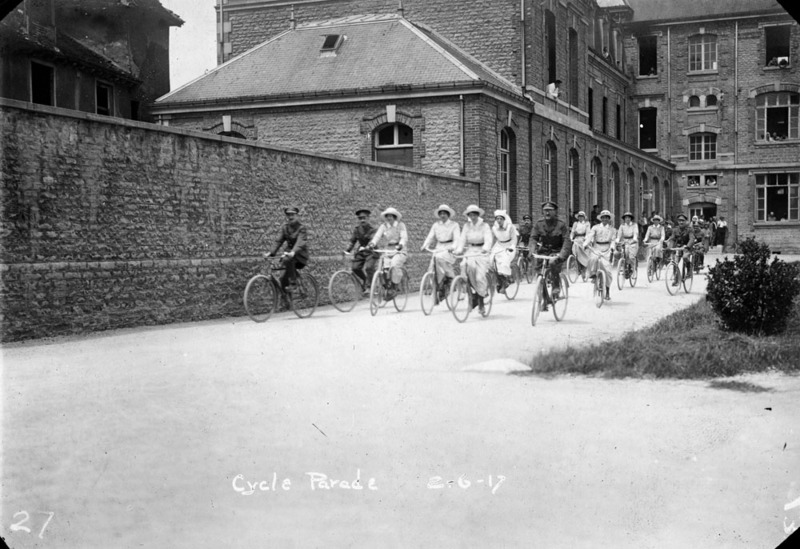 Most were posted well back from the front lines, working in general or convalescent hospitals. On occasion they were at the Casualty Clearing Stations as described in part one. BIFHSGO has a project on No. 1 Canadian Casualty Clearing Station. AncestryDNA, the DNA test for genetic genealogy with the largest database, is on sale until 3 July at a Canada Day price of $89. It includes taxes but NOT shipping. Find out more at www.ancestry.ca/dna/. The more people who test the greater the chance of finding a serendipitous match. Most matches are good news. Be aware there is always the chance of finding a relative whose connection had been hidden which may or may not be good news, but is reality too. The following is via a press release from Family Tree Magazine. announce the Society of Genealogists (SoG) as an Associate Sponsor of the event. all levels of family history experience. The first commercial DNA testing company, Oxford Ancestors, looks as if it will not close as previously announced. On a new website they are offering very basic mitochondrial and Y-chromosome tests. The Oxford Ancestors MatriLine Classic service examines a 400 base pair long section of mtDNA. The cost is £199, about $351 Canadian. Compare that of the Family Tree DNA test of the full mitochondrial sequence of 16,569 base pairs (41 times more than Oxford Ancestors) for $199 US about $265 Canadian. The Oxford Ancestors Paternal Ancestry test covers "twenty-six elements of your yDNA fingerprint" at a cost of £199, about $351 Canadian. Compare that to the FTDNA 37 marker test at $169 US or about $225 Canadian. Webinar: Lightroom or Photoshop? What should I use for my photo editing? Do you edit photos? If so the free Legacy Family Tree Webinars presentation this Wednesday on Adobe Photoshop and Adobe Lightroom may be of interest. The webinar will breakdown why you should choose one over the other and why both of them are important to know and use. For those whose requirements are more modest GIMP or Paint.NET, both free, were recently recommended. Something old, something new, somethings borrowed, something blue (blood that is!) If you've viewed past videos I've posted from Maurice Gleeson you'll likely recognize some of the material in this talk from the post-conference tour arranged by the New Zealand Society of Genealogists. It's an overview of his approach to dealing with adoptees, foundlings, or illegitimacies commonly encountered during family tree research. 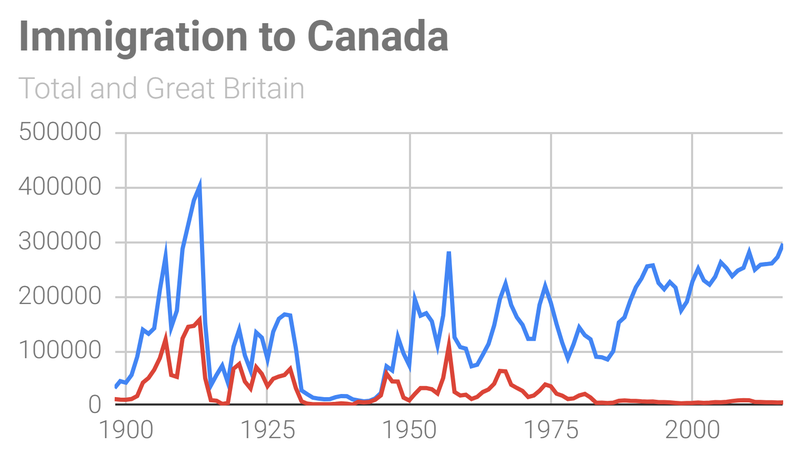 The statistics in this chart are taken from the Canada Year Book and for later years Citizenship and Immigration Annual Report to Parliament on Immigration (Google it for the year of interest). Rootstech is a once in a lifetime experience. Not to be missed—once. Very intensive with 17,000 people milling around. OGS is offering a group package for C$1799.00 pp sharing, NOT include RootsTech registration. It leaves from Toronto on Sunday 24 February returning on Sunday 3 March. I note the flights are direct non-stop which minimizes the stress of travel. Find out more at https://ogs.on.ca/research-rootstech-2019/. 657 issues of the weekly Arnprior Chronicle are now available online, from 3 July 1887 to 30 December 1937 thanks to an initiative of the Arnprior & McNab-Braeside Archives. The coverage is not complete. There are scattered issues from the period to March 1890 with complete coverage for the remainder of the year. Then there's a gap until June 1897, scattered issues to January 1912, no issues for 1913, good coverage for 1914, scattered coverage again to January 1929 and then virtually complete coverage to the end of the period in December 1937. AMBA hope to fill the gaps when other issues are donated to the Archives. Issues are searchable individually as pdfs. The digitization was funded by a grant from the Ottawa Branch of the Ontario Genealogical Society. Thanks to Irene Robillard for the information. Is Trump Ready for a Global Outbreak? History; June 20 1942: Canada under attack! chaired by Guy Berthiaume, Librian and Archivist of Canada, discusses challenges and solutions regarding the spread of misinformation online. A salute to Librarian and Archivist of Canada, Dr Guy Berthiaume, on the occasion of the fourth anniversary of his assuming the role. An index from the Fife Family History Society with 265,974 deaths recorded in Fife's old parish records including deaths and burials from St Andrews and Edinburgh Testaments (from 1549 to 1823), sheriff court wills (1824-1854), Fife newspapers (1822-1854), kirk session account books for mortcloths, lair registers and more. This week Findmypast has a focus on Wiltshire Quaker records. Over 1,500 Quaker records added to the Wiltshire parish baptisms index with (usually) birth date, baptism date, parish and parents' names. Over 261,000 new Wiltshire marriages records now available with a combination of birth year, marital status, residence, marriage date, whether married by banns or license, fathers name, spouse's details and the names of any witnesses. Many of these are sourced from Phillimore’s published marriage registers and are not Quakers—despite the incorrect information from Findmypast. Over 1,800 Quaker burials added to the Wiltshire parish burial index including year of birth, the date of death, the date of burial and location. Jonathan Oates, who specialises in London, recently released London's East End. "He outlines in vivid detail the development of the neighbourhoods that constitute the East End. In a series of information-filled chapters, he explores East End industries and employment – the docks, warehouses, factories, markets and shops. He looks at its historic poverty and describes how it gained a reputation for criminality, partly because of notorious criminals like Jack the Ripper and the Krays. This dark side to the history contrasts with the liveliness of the East End entertainments and the strong social bonds of the immigrants who made their home there – Huguenots, Jews, Bangladeshis and many others." Criminal Women 1850-1920: Researching the Lives of Britain’s Female Offenders, By Barry Godfrey and Lucy Williams. "The book is split into three sections. There is an introduction outlining the historical context for the study of female crime and punishment, then a series of real-life case studies which show in a vivid way the complexity of female offenders’ lives and follows them through the penal system. The third section is a detailed guide to archival and online sources that readers can consult in order to explore the life-histories of criminal women." Tracing Your Irish Family History on the Internet: A Guide for Family Historians, By Chris Paton — a re-release of a popular 2013 original publication. "Thanks to the pioneering efforts of the Public Record Office of Northern Ireland, the National Archives of Ireland, organizations such as FindmyPast Ireland, Ancestry.co.uk and RootsIreland, and the massive volunteer genealogical community, more and more of Ireland's historical resources are accessible from afar. As well as exploring the various categories of records that the family historian can turn to, Chris Paton illustrates their use with fascinating case studies. He fully explores the online records available from both the north and the south from the earliest times to the present day. Many overseas collections are also included, and he looks at social networking in an Irish context where many exciting projects are currently underway." How Our Ancestors Died: A Guide for Family Historians, By Simon Willis — a re-release of a 2013 original publication. "Describes the common causes of death - cancer, cholera, dysentery, influenza, malaria, scurvy, smallpox, stroke, tuberculosis, typhus, yellow fever, venereal disease and the afflictions of old age. Alcoholism is included, as are childbirth and childhood infections, heart disease, mental illness and dementia. Accidents feature prominently – road and rail accidents, accidents at work – and death through addiction and abuse is covered as well as death through violence and war. Simon Wills's work gives a vivid picture of the hazards our ancestors faced and their understanding of them. It also reveals how life and death have changed over the centuries, how medical science has advanced so that some once-mortal illnesses are now curable while others are just as deadly now as they were then." ● See where your forebears lived, farmed or perhaps occupied a small cottage or a massive estate. Is there someone in your family tree who farmed on the Prairies? Did they settle in the period from the opening of the West by the railway in 1885 and the First World War. If so they were fortunate to have arrived during a period with a favourable climate—only minor droughts. As you can see from the bar chart the period was preceded and followed (the dirty thirties) by multi-decadal droughts. We can only imagine how different development would have been without the favourable climate. 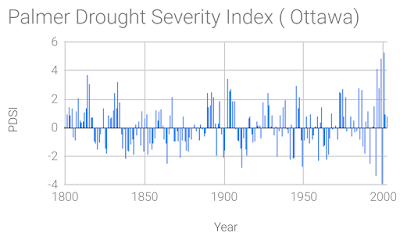 The bar chart is taken from the SaskAdapt webpage on drought. There is no source given for what is described as Annual Precipitation Variation From the Average. 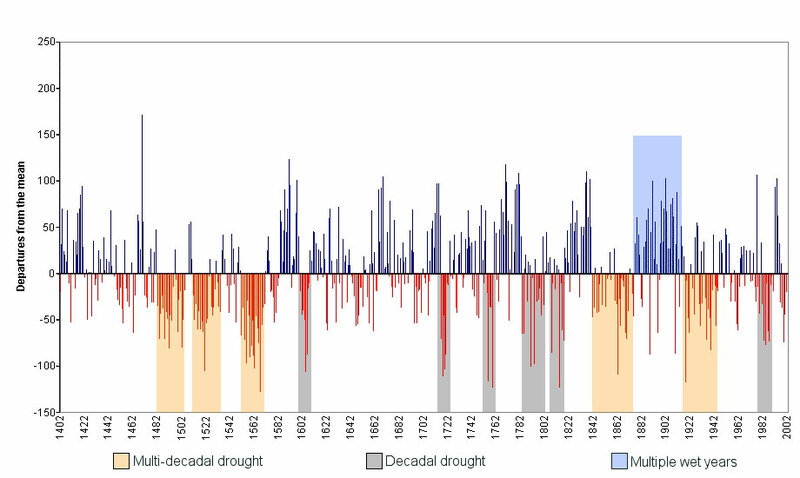 I'm sure there were no precipitation measurements for the first two-thirds of the period shown so suspect it's derived from an analysis of tree-ring data at https://iridl.ldeo.columbia.edu/SOURCES/.LDEO/.TRL/.NADA2004/.pdsi-atlas.html. 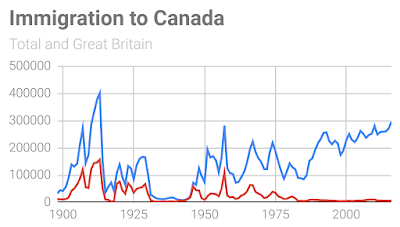 The second bar chart is from the same tree-ring dataset for the point nearest to Ottawa. Negative values are drier than average. 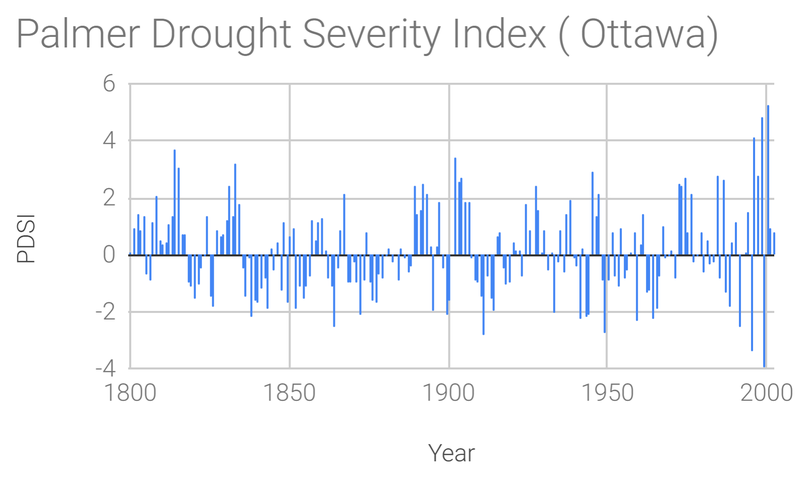 Unfortunately the tree-ring data used isn't very close to Ottawa so I'm skeptical about how well it represents the city; the year 1870 that saw a major Ottawa Valley Fire although drier than average was not especially so according to the PDSI. Drought is a serious problem for Canada's farmers. 60 per cent of our croplands and 80 per cent of our range lands are in dry-land areas. Wildfires flourish. Drought can reduce hydro-electric output, hamper navigation and recreational opportunity. These days while the extent of drought in Canada is well monitored the forecast reliability remain very limited and is no substitute for being prepared for the inevitable next drought event. What do we know about droughts, devastating for a country where the population relied on the productivity of the land? On Saturday, 23 June experience a three-course genealogical meal with OGS Ottawa Branch. Hors d'ouvre, served at 10:30 am, is a Genealogy: Back to Basics session on Evaluating Your Evidence. Mike More will provide tips on evaluating the information that you have found. 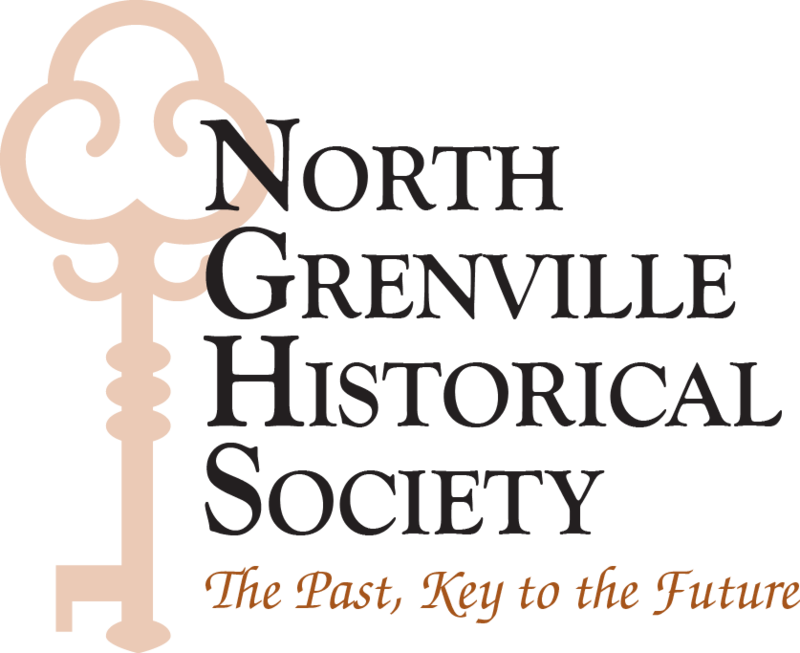 The main meal, served at 1:30 pm, following 30 minutes to savour delights to come, is a presentation on the North Grenville Historical Society by Dr. David Shanahan. Stay for dessert at 3 pm with a meeting of the Computer Special Interest Group. It's all at the City of Ottawa Archives, 100 Tallwood Drive (Room 115); there are (mostly) non-fattening refreshments and no dishes to wash.
You can get a refill of genealogy through the summer with drop-in sessions at the Nepean Centrepointe branch of the Ottawa Public Library, in conjunction with Ottawa Branch, on 26 June, 10 July, 7 and 21 August and 4 September. 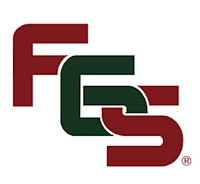 Are you considering attending the US Federation of Genealogical Societies conference in Fort Wayne, Indiana from 22-25 August? It's one of the largest genealogical conferences in the US, but not so overwhelming at Rootstech. Find out about the conference here. There are myths surrounding the conference? To counteract them FGS issued a myth-buster. What isn't a myth is that by attending Canadians help support the present US administration. You might want to do so to show how much you are in favour of their policies on immigration, trade and firearms, especially as Indiana voted for the President in the 2016 election. Canadians could show their support even more by ignoring just how much more expensive it will be for them as the US dollar has strengthened against the Loonie. The Halifax Public Libraries has a new fresh look for Local and Family History on its website. There are blog posts, a virtual archives and much more including advertising the popular Obituary Search Service: https://www.halifaxpubliclibraries.ca/blogs/post/obituary-searches-ask-a-librarian/. Here's a great service. Staff will conduct a search, for free, three names per email request, and mail out hard copies, for free, (but not email) of obituaries found in either the Chronicle Herald/Mail Star/Daily News, plus a handful of Dartmouth newspapers. Thanks to Joanne McCarthy from the HPL for the tip. For those of us in Ottawa, Library and Archives Canada has microfilms of the Halifax Chronicle-Herald, and prior to that the Chronicle, with self-service open access, no need to order in advance of a visit. Sadly no online version, even for the Morning Chronicle (1864-1927). The FreeBMD Database was updated on Sunday 17 June 2018 and to contain 268,252,090 distinct records (there were 267,753,711 records at previous update). Years with updates of more than 5,000 records are for births 1963-64, 1978, 1980-83; for marriages 1966, 1980, 1982-83; for deaths 1859, 1981-83. Don't get too excited but newspapers.com has now placed online a few issues from Canadian newspapers not included before: the Ottawa Citizen, Calgary Herald and Edmonton Journal. Why not excited? They're for a handful of days in April and May this year. Will there be more to come? Also the Montreal Gazette coverage is updated to April this year. There are now 2,027,632 pages in the collection going back to 1857. How much better would the situation be if Library and Archives Canada had exercised the type of leadership displayed by its peers internationally for a coherent national program of newspaper access and digitization? For LAC people who see this mention as akin to a continuing toothache, it will not go away without treatment. It was a surprise to learn at Saturday's Voices from the Dust event that Laurie Dougherty has retired from the Archivist position at the Arnprior and McNab/Braeside Archives as of the end of May. I found Laurie to be most helpful on the occasions I sought her advice. She was a progressive influence. I wish her well. Her replacement is Emma Carey, a graduate of McGill University who subsequently studied and worked in Scotland and Toronto. Naturally it will take some while for her to find her feet. All the best Emma. There's a new collection, Aberdeenshire, Scotland, Electoral Registers, 1832-1976 with 3,219,223 records on Ancestry. Sourced from the Aberdeen City and Aberdeenshire Archives the originals are usually printed and the index based on text recognition software. I did find some early volumes handwritten and available for browsing but not indexed for searching. Search boxes available are first name, last name, event year, keyword and residence year. There are no registers for the war years 1916, 1917 and 1940, 1941, 1942, 1943 and 1944. Information available is typically first and last name, occupation (not found in later years), place of abode, and nature of qualification to vote (also not found in later years). The collection is indexed for every fifth year, other years require visually scanning images available. Ancestry has also updated the collection Fife, Scotland, Electoral Registers, 1914-1966 with 1,071,893 entries. Grave Reference: Sec. 53. 1. 7-8. Additional Information: Son of Fred W. and Eva C. Carling, of 354, Sparks St., Ottawa, Ont. ; husband of Annie C. Carling, of New Westminster, British Columbia. 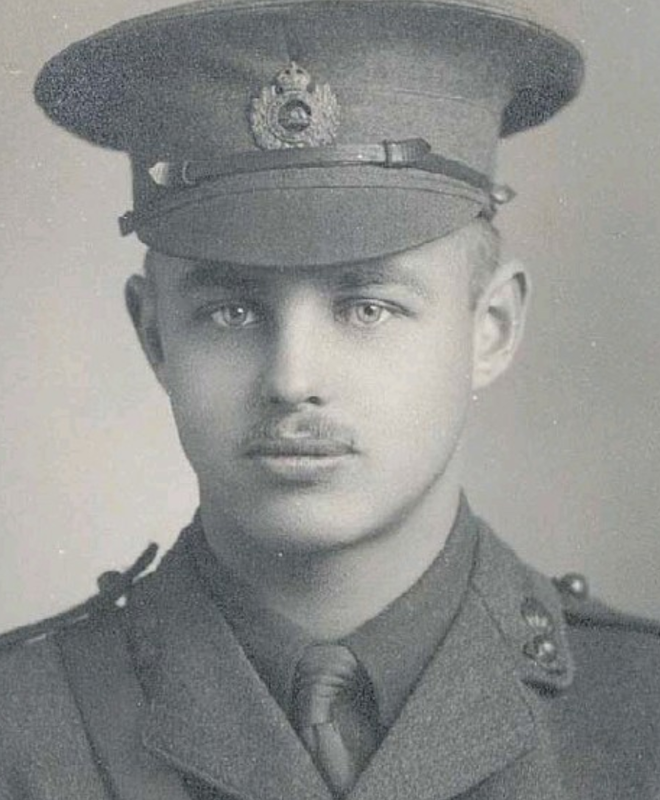 See his entry in the Canadian Great War Project. Venture into any library with a serious genealogical collection and you'll find volumes referenced as Filby, P. William, ed. Passenger and Immigration Lists Index, 1500s-1900s. They're in both the Ottawa Main and Centrepointe libraries. Early passenger lists are rare. Filby gleaned records from books, journal articles and original records to provide bibliographic entries indexed by family names. This Ancestry update incorporates 5,444,446 records. Filby's original publication was in 1981, 37 years ago. It's still valuable although much of the content is legacy. For example, it includes many entries for Ontario citing Bruce Elliott's Index to the 1871 Census of Ontario; and the Ancestry listing makes it look as if those people arrived in 1871! Beware! Who was P(ercy) William Filby? According to this biographical sketch Filby was born in Cambridge, England, on 10 December, 1911. He joined the staff of Cambridge University Library while taking German courses at the University. During the Second World War he was a member of the cryptographic team at Bletchley Park where Germany's ULTRA code was broken. On marriage in 1957 he moved to the US working at the Peabody Institute Library in Baltimore and subsequently as director of the Maryland Historical Society. He died at his home in Savage, Maryland, on 2 November, 2002. Best Before BIFHSGO talk by a member to Sheila Dohoo Faure for her presentation on the No. 1 Canadian Casualty Clearing Station. Best BIFHSGO talk by a member – or members – goes to Susan Davis, Darrel Kennedy, Brian Laurie-Beaumont and Marianne Rasmus for their talk on Salem, “Where were you in 1692?” An honorary mention goes to Glenn Wright for his part in that presentation. The above awards were voted by the membership. The following was selected by a committee empanelled by ACR editor Jean Kitchen. Kathryn Lake Hogan has a new initiative—a weekly webinar called Genealogy with a Canadian Twist. 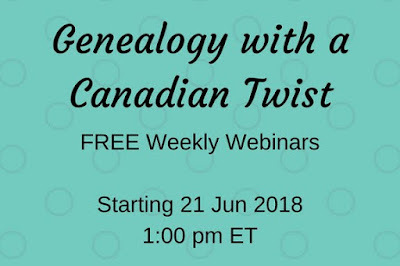 She writes on her website Looking4Ancestors that "every Thursday (or almost every Thursday) at 1:00 pm ET I'll be hosting and moderating a free weekly webinar about Canadian genealogy, and genealogy from a Canadian perspective. There'll be other topics too, like history, and special events." You can read more at the link above. For bragging rights to say you attended the first in the series this coming Thursday register at https://zoom.us/webinar/registerAA/N_0FkYKjFjRUq7Tkb1SBoeuA/. A limited number of spots are available during the live webinar. It will be recorded and made available for 48 hours afterwards. 934,145 records are in FMP's version of the National Archives' collection of medical records from the First World War newly available. The records are admission and discharge registers from various medical facilities. There's one line per soldier with initials rather than first name(s), last name, age, birth year, service number, rank, company / squadron, corps, hospital, admission date, discharge or transfer date and archival information. Additional information in linked images of the original includes number of years of service, nature of the affliction—from sore feet to gunshot wound, religion and brief observations. The records are a representative selection of the original collection; others are believed to have been destroyed. Take a journey through some of Ottawa’s most interesting neighbourhoods. As part of Welcoming Ottawa Week, June 18 to 30, 2018, the Ottawa Local Immigration Partnership, Heritage Ottawa, City of Ottawa and Immigration, Refugees and Citizenship Canada have joined together to host a series of guided walking tours to Chinatown, Little Italy, Lowertown West, Lowertown East and Vanier. I took the Little Italy tour last year. It was interesting enough I'll likely try another this year. Find more information and links to register here. As of 15 June 2018 there are 601,736 (592,203 last month) of about 640,000 files available online in the LAC Personnel Records of the First World War database. The latest box available is 10,331 (10,117) and last name Whitte (Waterous). The pace was down by more than 1,100 from the previous period. At the last month's rate the last file would still be online by the end of September. President Barbara Tose awarded two Certificates of Recognition at the BIFHSGO AGM on 9 June 2018. Cliff Adams in appreciation of his ongoing and significant contributions to the British Isles Family History Society of Greater Ottawa as Conference Treasurer, and his invaluable assistance to (and as) Treasurer of the Society. Father Edward J.R. Jackman in recognition of his life-long interest in and encouragement of family history and genealogy and with special appreciation of his generous sponsorship and support of our Society and its activities. On Sunday, 17 June at 7pm, Dirk Decuypere will speak at Ottawa's Pinhey's Point National Historic Site about his research identifying and recovering WW2 aircraft including three Canadians commemorated by the Commonwealth War Graves Commission in Belgium in 2017. One was Lieut. Lindsay Drummond a descendant of the Pinhey family who was shot through the heart on the evening of May 18,1917 while attacking a German observation balloon. Dirk Decuypere, co-founder of the aviation archaeology group Huyghe-Decuypere in West Flanders, undertook a five year project to obtain their CWGC recognition. At last Saturday's AGM of the British Isles Family History Society of Greater Ottawa President Barbara Tose announced that Jane Down's appointment to the Society Hall of Fame. 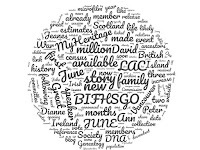 "Jane Down, a BIFHSGO member since 1997, has worked tirelessly for the betterment of the Society and for genealogy in general. She has volunteered in many capacities, serving eight years as BIFHSGO Program Director and several years on the Program committee for our annual conference. Her most recent contribution has been to take on the duties of Administration chair for the 2018 conference. Jane has also been an active member of the Ontario Genealogical Society and served as the Program chair for the OGS 2017 conference in Ottawa. Jane has lectured on research organization and authored a Researchers Aid on the topic. Through the years Jane has enthusiastically researched her family’s history and has presented her findings at monthly meetings, in Anglo-Celtic Roots and in other journals. From her first award at Gene-O-Rama in 1994 for her book on her Bradford line to winning the Alan Neame Award from the Kent FHS in 2017, Jane has always striven for quality in her research and writing. Her many contributions make her a well-qualified and deserving candidate for BIFHSGO’s Hall of Fame." 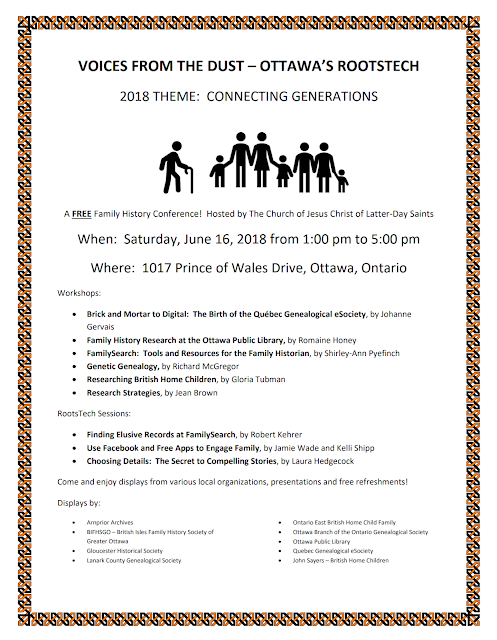 The Saturday 16 June 16, 2018 meeting is a "Genealogy Workshop, Open Forum, Getting Ready for Summer." It's an opportunity to ask questions and share basic tips to sharpen your research skills. Come prepared to learn, share and take home some suggestions on how to tackle your next research project. Held at Quinte West Public Library, 7 Creswell Dr, Trenton 1-3 pm. Everyone welcome, bring a friend. The following is an announcement from the Perth & District Historical Society. For the meeting of Thursday, 21 June join the Committee and the historical society in a very different event – a ‘Meet & Mingle’ at Maximilian’s Restaurant, 99 Gore Street East, Perth (7:30pm). The June event is an enjoyable opportunity to meet the committee and other ‘friends’ of the Society, in one of Perth’s most prominent historic buildings, celebrate the restaurant’s 45th anniversary, and, not least, commemorate the Summer Solstice – marking one of our most ancient traditions. For further information on this event, please call 613-264-8362. 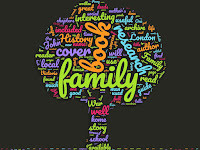 The (UK) Federation of Family History Societies offers a page of reviews of recent genealogy books. The reviews are fairly short, typically around 300 words. Unofficial Guide to Ancestry.com: How to Find your Family History on the #1 Genealogy Website, Second Edition, By Nancy Hendrickson has 32 holds on 6 copies. BTW: The Toronto Public Library has 6 copies and no holds. Children's Homes: A History of Institutional Care for Britain's Young, By Peter Higginbotham has 7 holds on 4 copies. Genealogy for Dummies, eBook, By Matthew L. Helm has 10 holds on 2 copies. The Street-wise Guide to Doing your Family History, By Mary Teviot has 23 holds on 5 copies. Tracing Your Georgian Ancestors : A Guide for Family and Local Historians, By John Wintrip is on order with 5 holds on 1 copy. 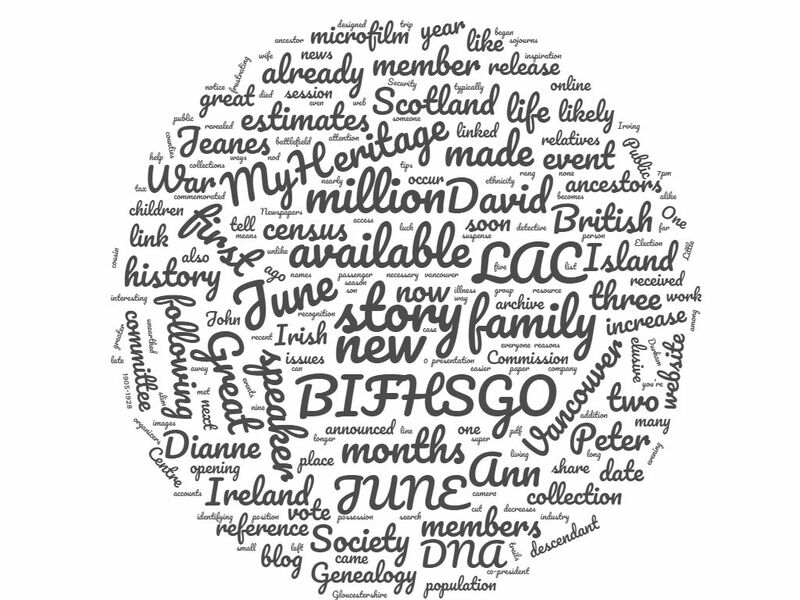 Scottish Genealogy, By Bruce Durie (featured speaker at the BIFHSGO conference in September) has no holds but 5 of the 6 copies in the OPL system are borrowed and the other is for reference at the Main Branch. 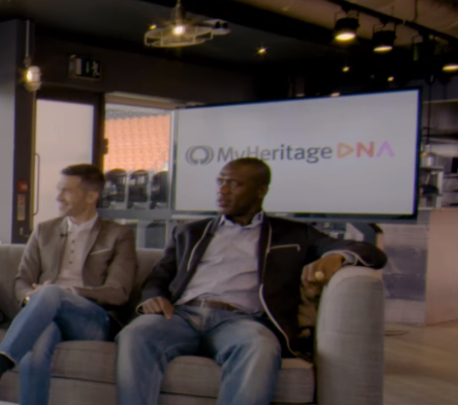 Enthusiasm is mounting among football (soccer) fanatics for the FIFA World Cup and MyHeritage is catching the wave. "Eight "legendary" players reunite on the pitch to discuss national rivalries, reminisce and laugh together — and see their ethnicity breakdowns revealed through the MyHeritage DNA test." See the resulting 13:38 minute video from MyHeritage. John Grenham has been nose to the grindstone for the best part of a year tackling the backlog of census corrections suggested to the Irish National Archives. In a blog post he writes he will have processed around 50,000 of the 100,000 emails by the end of June which includes about a quarter of a million suggested changes. Half are turning out to be accurate, a third are duplicates (corrections suggested more than once), and only 15% are downright inaccurate. Corrections are incorporated in monthly batches on census.nationalarchives.ie/. They do not get included in the census versions on commercial sites. The email linking the online version of Family Tree's July issue arrived on 6 June. It happens earlier each month as the magazine publishes both December and Christmas issues. There's fresh information throughout the issue, but will leave aside details of the regular columns: Family history news, Dear Tom, Family Tree Academy, The lunch-hour genealogist, Taken a DNA test? Now what?, Techy tips for family historians, Twiglets, Family Tree Subscriber Club, Books, Your Q&As: advice, Diary Dates, Mailbox, Your adverts. There's a focus this month on women marking the centenary of women (over 30 with some property rights) getting the vote. In the wake of the Windrush, 10-year-old Edwin Joseph came to Britain. Flere his wife Jane Joseph traces his ancestry back to British Guiana and ultimately Africa, from where his 3x great-grandparents had been sold into slavery themselves. Comment: NOT first world issues—"Until you wage a daily battle to prevent termites eating away the insides of the books on your shelves and the pictures in your frames before moving on to eat away your wooden house, you don’t really understand why parish churches or schools in the tropics rarely have registers dating back more than a generation." Don’t assume your ancestors all married and died young. Dr Edward Dutton has some surprising news. Comment: My 2-times great grandfather lived to be older than his son my great-grandfather. That's more likely than not according to the statistics in this article. If you like to put your ancestry in the context of the times read this article to better understand why lifespan decreased. Chris Paton describers how pursuing the stories of his female ancestors may often be difficult, but never any less important. Comment: Chris always has something worthwhile and often new to me in his articles. This time it's The Army Children Archive. To mark the centenary of the vote being granted to some women, and the 90th anniversary of full equal franchise, Rachel Bellerby takes a tour through centuries of female history, looking at achievements in fields including medicine, industry, the military and entertainment. Comment: The article is crammed with useful links. This issue Jayne Shrimpton reflects on the changing attire of the early 1800s. Just what did our late Georgian and early Victorian ancestors wear? If you have a computer and access to the internet then you have what you need to start tracing your family tree. June Terrington is a huge fan of online research and has been finding ancestors and making family history connections for years! Comment: Another article crammed with links—for the beginner. There’s nothing like a written record of the past is there? This issue Julie Goucher looks at the correspondence material left by two outstanding Victorian women. Passionate to see the history of women remembered, campaigner Sarah Jackson has set about creating an East End Women's Museum. Simon Wilis pays a virtual visit. Roy Winchester would like to warmly welcome you to this large and successful family history society. Ruth A Symes reminds us how there is so much to interest family historians in Emily Bronte’s work as we mark 200 years since her birth. Researching your female line can be a real challenge, especially as maiden names can get lost or over time. Charlotte Soares took up the cause to help a fellow reader solve just such a problem. ‘What follows are probably the saddest in my whole family history’ - Diane Lindsay relates a tragic tale. Aimed at the beginner to intermediate level FutureLearn and the University of Strathclyde offer a free MOCC to help you develop an understanding of basic genealogy techniques and how to communicate your family history. Although the course is described as not geographically specific it is given in English and there is likely to be a UK perspective. Regiment/Service:Canadian Garrison Artillery No. 2 Artillery Bde. Grave Reference: 21-10. C.11. 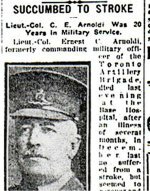 W.C.
Additional Information: Son of Elizabeth Douglas Arnoldi, of 647, Lothrop Avenue, Detroit, Michigan, U.S.A., and the late Lt.-Col. Ernest Clinton Arnoldi; husband of Elizabeth D. Arnoldi, of 2, Queen Mary Apartments, Elgin St., Ottawa, Ont. If you're looking at this item on the website you may notice a search box has been added in the left hand column. I thought there had been one there before but didn't see it when I checked so added it. With over 9,000 posts dating back to 2006 you can use the blog search as a resource for finding all kinds of information which has been posted over the years ... if you're not careful! Congratulations to Duncan Monkhouse acclaimed as the new President of the British Isles Family History Society of Greater Ottawa at The Society Annual General Meeting on Saturday. 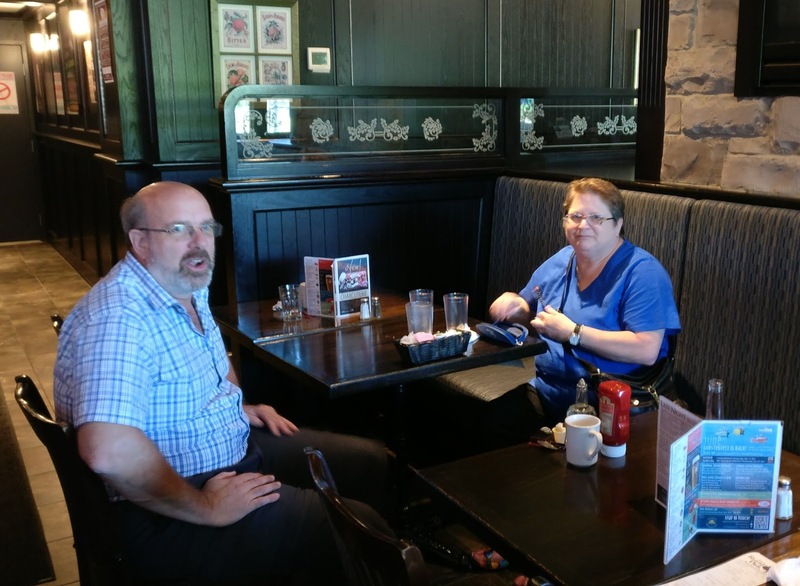 Immediate Past President Barbara Tose and Duncan took advantage of the lunch venue following the AGM and Great Moments session to discuss transitional issues like changing email address linkages. The remainder of the Board continue in their previous roles except for Glenn Wright who relinquishes the past president role while remaining as society archivist. 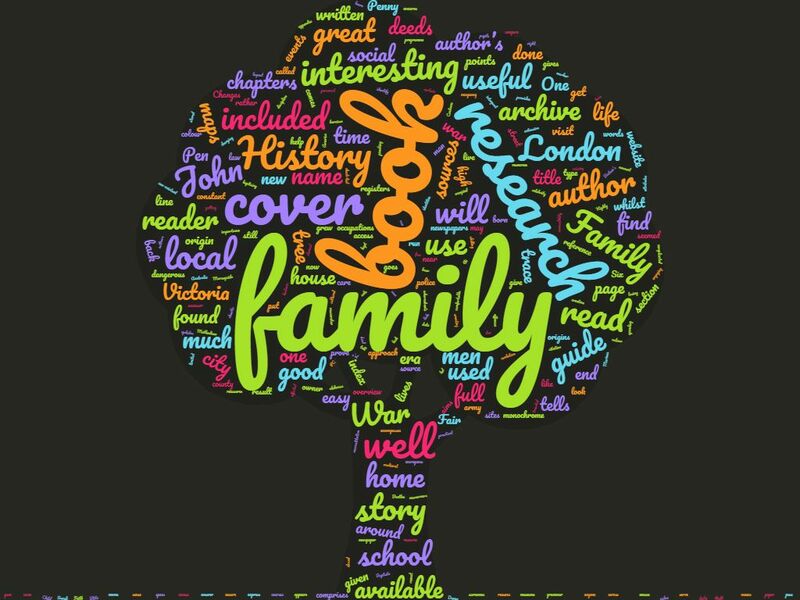 The Family Tree blog has inspiration for those considering entering a family history writing contest, like the 25th anniversary one BIFHSGO is holding for its members. Members are encouraged to write a story related to their British Isles family and submit it to the competition. There's more information here (pdf). Entries must be received by midnight on 31 May 2019. A couple of days ago I wrote about MyHeritage's security breach (here). The company has now moved to implement two-factor authentication (2FA) which they claim makes them among the first in the genealogy and DNA industry to do so. It's designed to ensure that you’re the only person who can access your account, even if someone knows your password. If you're a MyHeritage member follow the instructions here to take advantage of the greater security available. On Thursday the House of Commons Standing Committee on Canadian Heritage held its first hearing on the 2018-19 Main Estimates. Minister Melanie Joly made an opening statement and took questions from three committee members, each for a seven minute period. All questioners were members from Quebec. The video record is here. In her opening statement the Minister made reference to the funding request for the new joint LAC - Ottawa Public Library facility, the only mention of an LAC initiative. The session was cut short as the bells rang for a vote in the House of Commons. As the committee typically meets on Tuesday and Thursday the continuation of the hearing will likely occur next week. Will nearly $109 million of tax expenditures for LAC be approved by the committee on the nod? Advance Notice: Identifying and Recovering WW2 Aircraft. On Sunday, 17 June at 7pm, Dirk Decuypere will speak at Ottawa's Pinhey's Point Historic Site about his research identifying and recovering WW2 aircraft including three Canadians commemorated by the Commonwealth War Graves Commission in Belgium in 2017. The following information was provided by Johanna Smith, Director General, Public Services Branch at Library and Archives Canada. The preparation and digitization of the original (1926 census) microfilm began a few months ago, and we are currently developing the index and contextual material. As soon as these are ready and the interface is translated and the content is linked and prepared for the web, we will make the data and images from the census available on the LAC website. In the coming months we will be in a better position to estimate a release date. Comment: The reference to "in the coming months" is not good news. 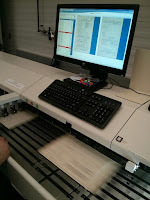 The microfilm has been in LAC possession for months prior to the official transfer date. Digital microfilm could have been quickly produced and made available online as soon as the transfer date arrived. Why was this not done allowing public release as soon as possible and various indexing initiatives, including crowdsourcing, to occur? TheGenealogist has added directories for Nottingham, Glasgow, Leicestershire & Rutland, Derby, Shropshire, and Kent to its 1921 census substitute collection. These are added to those already available for Aberdeen, Bath, Berkshire, Bradford and Surrounding Districts, Bristol and Suburbs, Brixton and Clapham, Buckinghamshire, Cambridgeshire, Channel Islands, Cheshire, Cumberland, Dorset, Durham, Hessle, Hull, Lincolnshire, London, London County Suburbs, Middlesbrough, Norfolk, Northumberland, Oxfordshire, Somerset, Suffolk, Westmorland, Wiltshire, Worcestershire and Yorkshire. The total collection is now 1.75 million heads of household. The total population for England, Scotland and Wales was 43.7 million. This Saturday, 9 June, come to The Chamber at Centrepointe Nepean for all the excitement and suspense of the BIFHSGO Annual General Meeting, starting at 9 am. As an additional attraction, starting at 10 am, four society members present in the semi-annual Great Moments in Genealogy session. Was my Great-great Uncle David Jeanes a Murderer? David Jeanes' great great uncle, David Jeanes, a coachbuilder in Cathays, Cardiff, left Britain mysteriously and suddenly in the 1880s. The family never spoke of him, and David only heard sketchy mentions of him by his grandfather and a cousin of his father. Searching ship passenger lists, South African church records, and finally the wonderful new resource, Welsh Newspapers Online, revealed a sensational story. David Jeanes is a BIFHSGO member, president of Heritage Ottawa, and member of the executive of the Ottawa Welsh Society. What happened in the 19th century when your husband died leaving you with three small children to support? When those children proposed moving away in search of a better life? Mary Oliver Brydon emigrated to Ontario from Scotland as a child around 1830. Dianne Brydon will tell the tragic story of Mary's life, a case study in women's limited options and how 19th-century society dealt with mental illness. A great moment happened when two 4th cousins found each other and compared documents they had each unearthed. This is Dianne Brydon's second Great Moment presentation. In June 2017 she talked about research with her father for their book, The Stalwart Brydons: From Scotland to Galt to Portage La Prairie. The book also includes the story of Mary Brydon's early life. During a book tour through southern Manitoba, Dianne met Carol Bray, Mary's descendant, and co-president of the Beautiful Plains branch of the Manitoba Genealogical Society. Carol had discovered the details of Mary's later life, which had been elusive for many years. Together, they crafted the story which Dianne will present. A lonely Commonwealth War Graves Commission headstone standing at Czar, Alberta marks the resting place of the first CEF soldier to die in the First World War. Born in Stroud, Gloucestershire, like many volunteers he was a recent immigrant; unlike most he had an unusual amount of military background. John D. Reid will share his family history story. John D. Reid, a proud son of Norfolk, is a Society past president and member of the BIFHSGO Hall of Fame. Best known of his blog, Canada's Anglo-Celtic Connections, he writes a regular column in BIFHSGO's Anglo-Celtic Roots. One of Ann Burns' most frustrating brick walls had been her great-great-grandfather Patrick Fitzpatrick and his wife Annie Fennell. All Ann knew were their names and the counties in Ireland they came from. While Patrick remains elusive, a combination of detective work at home, release of the Irish parish records, expanded searchable databases, some friendly help in Ireland, and a bit of Irish luck, allowed Ann to go back two more generations, not only to the Fennell ancestors, but the very place they came from. 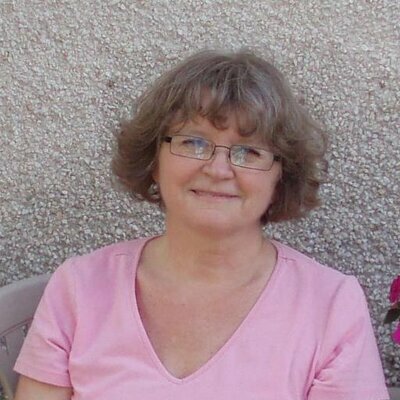 Ann Burns started researching her family history in 2003 and joined BIFHSGO in 2004. Inspiration for this pursuit had a long build-up, but retirement made it much easier. A trip to Ireland in 2008, where a connection was made with living relatives, has been followed by nine more trips. During these sojourns, of two weeks to three months duration, other than visiting relatives, Ann spends as much time as possible following paper trails and winding roads, tracking down clues about her Irish ancestors. Nobody should tell you how to vote. Be alert for fake news. Depending on the riding you have a choice of 28 parties, and independent. Proceed to the poll now, and vote. Thank you if you already voted. You are advised to change your password for MyHeritage. The background to the security breach of 92 million accounts is on this MyHeritage blog post. It's shocking there's been no notice directly to subscribers! An interesting story. Good television and the first episode this season that didn't start with an AncestryDNA test. In the cold light of dawn did anybody explain that 21 times great-grandfather ancestor Robert the Bruce (1274-1329) was one of about 16.8 million ancestors that far back? Did they mention that the population of the UK in 1300 was about 4.7 million so she is likely connected to Robert, and everyone else on both sides at the Bannockburn battlefield, multiple ways? And that the chances of her having inherited any of Robert the Bruce's DNA are slim to none. Southern Vancouver Island is already well served by fully searchable issues of the British Colonist from its first issue in 1858 to December 1950. Now the initiative is moving up-island. A project is underway to digitize editions of the Nanaimo Daily Free Press (1874-1928) and the Cowichan Leader (1905-1928). That's thanks to a $40,000 grant from the Irving K. Barber Learning Centre at the University of British Columbia supported by the Nanaimo Archives, the Nanaimo Historical Society and the Vancouver Island Regional Library. The issues will be freely available online. With a five-fold increase in the number of reference samples, now 16,000, AncestryDNA has changed ethnicity estimates. There are 17 new regions. The new estimates are based on stretches of DNA rather than individual letters (A, C, G or T) at particular bases. If you're like me your new estimates will likely be more aligned with your expectations before DNA results were available. My new estimate is more British. England and Wales 44%, an increase of 25%; Ireland and Scotland 34% an increase of 4%. There are decreases. A 4% reduction in European Jewish, 11% Scandinavian becomes 3% Norwegian and no longer any estimates for Europe West, Caucasus, Europe East or Iberian Peninsula. I previously mentioned that two new genealogy events are planned for the UK in 2019. Coming on a year before the event I received an email from organizers THE Kirsty Gray and Sylvia Valentine drawing my attention to an addition to the line up of speakers at their event in Birmingham next year, THE Genealogy Show (also Facebook link). The most recently announced speaker is Lisa Louise Cooke. Add Lisa to the list of US Rockstars already announced — Judy Russell and Blaine Bettinger. The event is scheduled for 7-8 June 2019 at the National Exhibition Centre in Birmingham which is where the late lamented WDYTYA? Live event most recently was held. It's a super convenient location for air and train travel. The need to digitize photo collections is shared by families and companies alike. This is an essential to both preserving history, and sharing it with others. Peter will share his reasons why using your own digital camera is the fastest, easiest and most economical way to achieve a digital archive. Professional photography skills are a plus, but by following the recipe approach, Peter makes such experience not necessary by any means. The link to register is on the OGS website.